he Parker "VS" — "Vacumatic Successor" or "Victory Successor" was introduced in late 1946. A last try during the hooded nib-era to introduce a pen with an open nib while the somewhat dated (right David?) Vacumatic was being phased out. The Parker "VS" is an excellent writer but it was sadly overlooked by the customers. The Parker "VS" was however more popular in Europe where it sold much better than in the US. The Danish Parker subsidiary, Christian Olsen, continued producing it into the 1950's, adding a colour not found in the US, the brown. It was very similar in design to the Parker 51. Outwardly the only thing that differed was the clip, which in turn was very similar to the later style Challenger, or striped Duofold "Duovac"-clip, a tapered version with the imprint "Parker". Inside the cap was a standard sized gold nib and had an uncommon feed, made in a transparent material referred to as "lucite", but this had the disadvantage of becoming ink stained from the inside rendering a somewhat dirty look, hence it was replaced by an ordinary black feed in early 1947. Mark I had a novelty filling system which was an aluminium button filler, fitted inside an aluminium socket, of the same design of the later 1948 Duofolds made in Newhaven, UK. This filler, in the Parker tradition, hid under a blind cap the colour of the body. The aluminium socket could be disassembled with the old Vacumatic tool. The Mark I's aluminium fillers however proved vulnerable to corrosion which rendered them stuck. I have tried the hard way losening them with pliers, oil and the occasional song and tap-dance, but to no avail, they seem fused. Later items, also from early 1947, had an integral button collar. There are also some extremely rare examples of demonstrator Parker "VS's". Most Parker "VS" come with Lustraloy caps, but there are also examples of custom VS's ( gold filled caps). 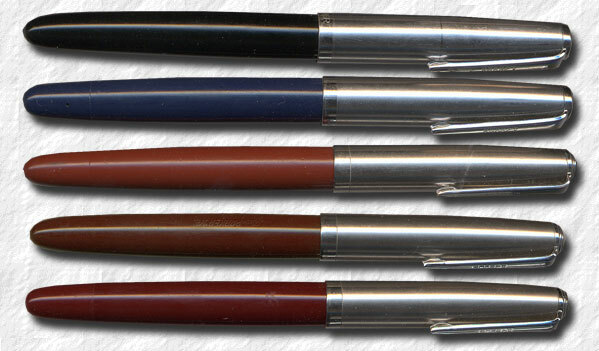 Five Parker "VS", in black, blue, rust, 1947. A Danish brown and a burgundy New VS, 1949.